I set myself a few goals this years. One of them is to visit more conferences in 2018. Preferable conferences in a few different countries. A so called web conference about the internet, design, UX, online marketing and everything in common. If you don’t want to read the whole post, you can see the conferences I will attend or I am interested in attending by clicking this link. List will probably be updated over the year. Over the last years I mostly visited one web conference in Germany a year. This conference was always payed by my employer. Which means my employer paid the travel costs, the hotel and the conference ticket itself, sometimes combined with a workshop. I did not had to use my holidays for it. This is of course a very nice way to visit a web conference. I don’t have to worry about money and holidays. Awesome. But it also has downsides. And don’t understand me wrong here. I am very grateful, that my employer invest money in my further education. Of course an employer will benefit of the high education and the motivation boost of its employees if it send its people to conferences. So it’s a win-win for both sides. And here they are – the downsides of company-sponsored conferences. And I know it is maybe complaining on a very high level. As I said, I am very grateful my employer is investing in me by sending me to a conference. First downside: I am not completely free in choosing a conference. Of course every employer likes you to visit a conference of which it is likely you carry home something which you can actually use in your daily work. Immediately. It’s very understandable. Second: at least my current employer is only willing to pay for conferences in Germany. Maybe there are exceptions, but very few. Looking at the travel costs, it is very understandable as well. What I need in 2018: something to learn, discover new things. Be more independent and more confident. Practicing my English. And speaking about independence – planning and travel on my own. To be honest, I am not too comfortable about this. But it’s time to learn. 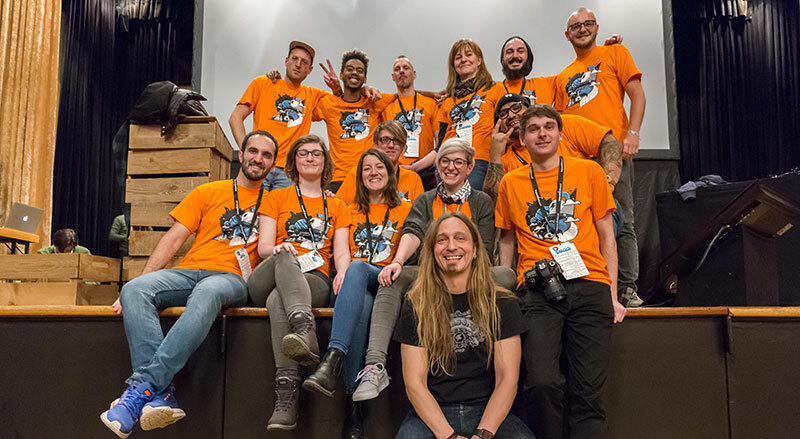 I was a proud member of the awesome team of volunteers at the beyond Tellerrand Munich 2018. Photo by Martin Kraft. The beyond Tellerrand Munich in January was a very special web conference for me. I volunteered for the very first time at the conference. It was a great experience and I met so much great people from all over the world. Not a conference but a hackathon. This is one of the employer-sponsored events this year. I have no real idea what I can do there and what my co-workers and me will create … but it sounds interesting. A web typography conference! I am no specialist in typography at all. But I love it and I can’t wait to learn more about it. So I bought more or less spontaneously a Super Early Bird ticket. Booked a flight already. No idea yet how to get from Stansted to Brighton. Oh… and I need a hotel. Here a further conferences I am interested in. It will be a matter of money and time, if I can visit one of them. And probably the help of my employer. I am especially interested in the UX special of the conference. Very, very tempting. But probably a bit over my budget. Update: I didn’t attend this one. Update Dec 1st: I was attending! And I wrote a blog post about it. Will I meet some of you at one of the conferences?